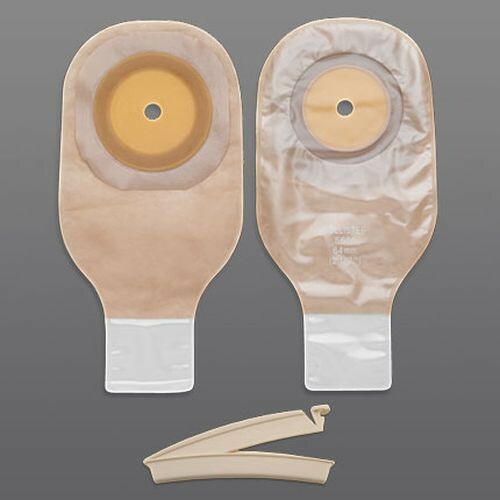 Premier Single-Use Kit for Colostomy/Ileostomy is a single-packet ostomy pouch kit that increases convenience via its simple application that actively works to reduce confusion. Designed with a stoma measuring guide, this ostomy pouch from Hollister Medical includes instructions for use in each package and comes equipped with a pouch clamp closure. Intended for single use, this Hollister Medical pouch has a barrier opening up to 2-1/2 Inches and a convenient tape border. You might also be interested in similar ostomy pouch products from Hollister, such as Hollister Karaya 5 Drainable Pouch with Belt Tabs 9 Inch.